614 S. Arlington Heights Road, Arlington Heights. Sears Starlight from the 1927 catalog. This Sears Starlight was built in the spring of 1927 for newlyweds Robert and Esther Flentie. The couple was married in February of that year, and the Daily Herald reported that, after their honeymoon, the couple was "ready to watch the erection of their new home in the south side." A young Robert Flentie around 1922. The name Flentie is familiar to Arlington Heights residents because of Flentie Park and Flentie Lane. They were named after Robert's father, Julius D. Flentie, who was mayor of Arlington Heights from 1927-1941. In September 1927, Esther was pregnant, got an infection, and was rushed to St. Francis Hospital in Evanston. She soon fell into a coma and was near death. The physicians gave her a Caesarian section and somehow the baby, Robert Jr., survived. Esther never regained consciousness and died only seven months after she was married. According to the Daily Herald, "...the body was laid out in the pretty new home which had been the pride of her heart, and many friends and neighbors came to show their last respects." 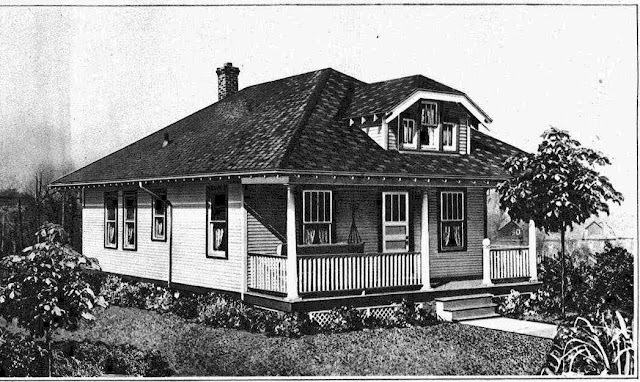 Robert Flentie quickly sold the Sears Starlight his wife loved, and by June 1928 he and his son had moved out. The new owners were Charles E. Compton and wife Gladys. Charles was an entomologist. By 1932 he and his family had moved to Champaign so he could take a job with the University of Illinois. The Starlight changed hands every few years after that point. After their move, the tragic story of the Flenties continued. Robert married again a year after his wife's death. The new wife, Verlie, was a cashier at the Arlington Heights State Bank at which they both worked. Robert died suddenly of a ruptured appendix in 1937, almost 10 years to the day when Esther died. Ten-year-old Robert Jr. apparently was not raised by his stepmother, Verlie. It appears that he went to live with his paternal grandparents Julius and Louise Flentie. Robert Jr. also died young at age 44 in Los Angeles. He was married but did not have children.